“Lindsey Vander Weide played like an All-American tonight” said Oregon head coach Matt Ulmer after his senior outside hitter posted 18 kills to lead the Oregon Ducks past the New Mexico State Aggies three sets to two (25-22, 28-25, 25-21, 25-11) to advance out of the opening round of the 2018 NCAA championship tournament Thursday evening at Matthew Knight Arena. “I felt like things were not clicking well with some other hitters so I know that is when I have to step up an do my job,” said Vander Weide. One of those hitters that struggled on the attack in the early going was left-hander Willow Johnson. 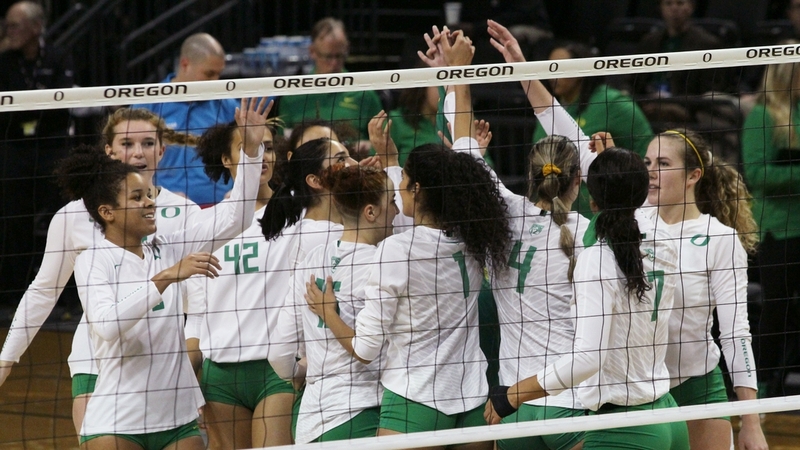 After the Ducks and the Aggies split the first two sets and midway through a back-and-forth third, Johnson found another way to help out her team. Not often called upon to serve, Johnson found herself remaining in the full rotation when Taylor Borup was sidelined with an ongoing ankle issue after two sets. With the Ducks leading 16-13 in the third set, Johnson toed the back line and served up four straight Oregon points, one with a service ace to put Oregon in front 2-1. Then in the fourth, the Ducks rattled off 10 straight points on Johnson’s serve to take a 15-6 lead and then coasted to the 25-11 result to advance to face Baylor in Friday’s second round action. “I knew I wasn’t having a good offensive night … I had the opportunity to serve so I really focused in and tried to give something to my team … just serving tough and aggressive,” said Johnson. The Ducks out hit the Aggies .315 to .207 and had a 62-48 advantage in digs. With the win the Ducks advance to face Baylor at 7:00 pm on Friday. The 25th-ranked Bears eliminated Hawaii in five hard-fought sets (23-25, 23-25, 25-14, 26-24, 16-14) earlier in the evening.